We are waist deep into summer, and for me that means that I need to avoid using my stove / oven at all costs. Especially this week; it was over 100 degrees F yesterday. So that means no real baking for the next couple of days / weeks / months. Oh, how I miss the 2 feet of snow I had in the backyard nigh just a few months ago. So since cooking and baking slow down, all this heat also means a lot of outdoor grilling and a lot of salads. And with the farmer’s markets in full swing, why not take advantage of nature’s bounty? 1. In a medium saucepan, bring the water to a boil with the bay leaf. Once boiling, add the vinegar and soy sauce. 2. Remove from the heat and add the glass noodle. Let steep for 5 – 7 minutes. 3. Strain and toss with some sesame oil. Set aside. 1. Whisk together olive oil, vinegars, and soy sauce until well blended. 2. Add honey and combine. The honey will help hold the emulsion and add some sweetness. 3. Add the black pepper and chopped garlic. Stir to coat and set aside. 1. Separate the leaves of lettuce. Place them in a water bath to wash them. Shred the leaves into bite-sized pieces and spin them dry. 2. Place a bed of the lettuces on a plate. 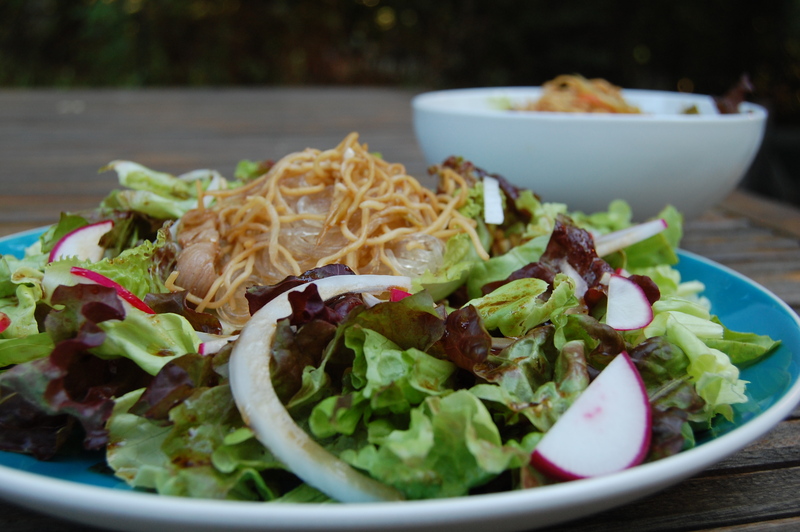 In the center of the lettuce, place 1/2 the noodle, twisted with a fork to make a “nest”. 3. Drizzle the salad with the dressing. 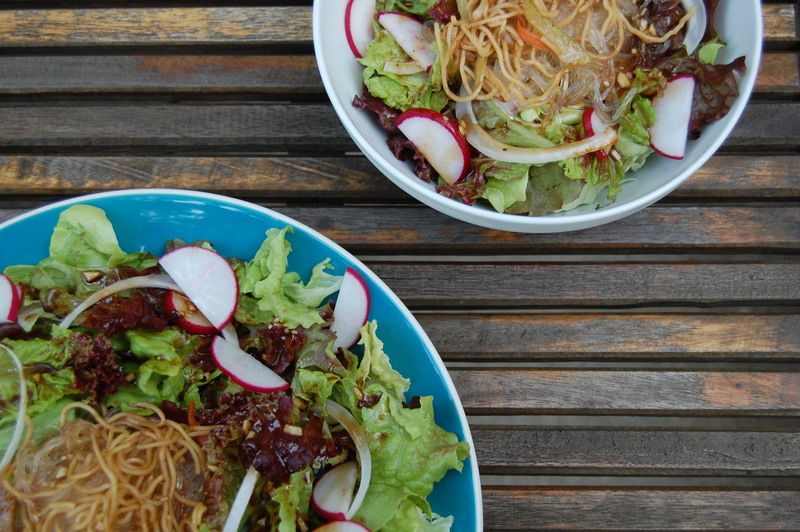 Whisk the vinaigrette to re-emulsify if it separated whilst assembling the salad. Repeat the steps to make a second salad or save everything to make a salad tomorrow! Notes — I did top off the noodles with some left over lo mein. I figured it would add a little bit of extra flavor, plus help clean out the fridge. 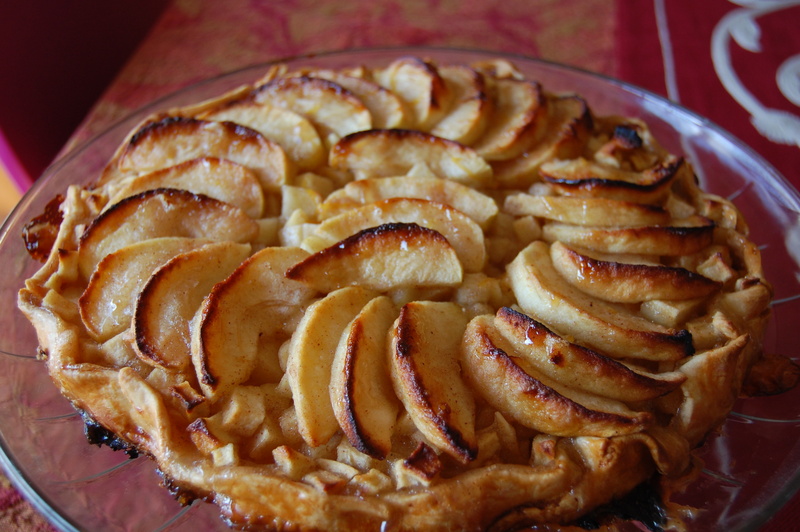 . . Also, I tend to like my dressings on the tart side, so I probably use more vinegar than most. Usually the ratio of oil to vinegar is around 3:1 depending on the strength of the vinegar. Try some different things out and see what you prefer. And use high quality stuff. You can’t mask sub-par ingredients here because you will definitely taste it. . . You will have plenty of extra greens here. After shredding them, just place them in a zip top bag with a slightly damp paper towel and they will stay fresh for a while, maybe a week or so. I can’t really recommend someone go to the market and just peel off a few leaves of lettuce here and there! This entry was posted in Main Dishes, Recipe, Salads, Sides and Appetizers, Vegetarian and tagged Food, Main courses, Recipes, Salads, Sides and Appetizers, Vegetarian. Your salad sounds good and has given me inspiration for tonight’s meal. glad i could help! thanks for stopping by!